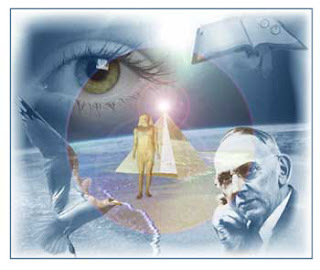 Years ago I saw a tv documentary about the psychic, Edgar Cayce (1877-1945). It so fascinated me that it became the psychic link I needed for Whitney and the spirit guides in my novel, The Little Universe. I read books about him and joined the foundation he began back in 1931, the ARE. Much of the below information comes directly from the Association for Research and Enlightenment's site. And for the skeptics, they should note that Cayce had a 6th grade education in Kentucky in the late 1800's, yet in his trances he had absolute knowledge of human anatomy, medicine, world history and more. Styled by the method and spiritual info from his readings, comes the contact from The Grandmother to Whitney in my novel, The Little Universe. Edgar Cayce is known as the "sleeping prophet," the "father of holistic medicine," and is the most documented psychic of the 20th century. For over 40 years he gave readings to thousands of seekers while in an unconscious state, diagnosing illnesses and revealing past lives and prophecies yet to come. People flocked from all over the world for a session with him, especially people in need of healing. Cayce was born on a farm in Hopkinsville, Kentucky in 1877. His abilities appeared at childhood, able to see and talk to his late grandfather's spirit and often played with "imaginary friends" whom he said were spirits on the other side. He also displayed an uncanny ability to memorize the pages of a book just by sleeping on it. These gifts labeled the young Cayce as strange, but all Cayce really wanted was to help others, especially children. Later in life, Cayce discovered that he had the ability to put himself into a sleep-like state by lying down on a couch, closing his eyes, and folding his hands over his stomach. In this state of relaxation and meditation, he was able to place his mind in contact with all time and space, the universal consciousness also known as the super-conscious mind. This is where he accessed the "Akashic records," the collection of all thoughts, actions, events, matter... the all there is and ever was. From his meditations, he answered questions as broad as, "What are the secrets of the universe?" and "What is my purpose in life?" to as specific as, "What can I do to help my arthritis?" and "How were the pyramids of Egypt built?" Many people are surprised to learn that Edgar Cayce was a devoted churchgoer and Sunday school teacher. At a young age, Cayce vowed to read the Bible for every year of his life (in fact, one son claims it was the only book he ever read), and at the time of his death in 1945 he had accomplished this task. Perhaps the readings said it best, when asked how to become psychic, Cayce’s advice was to become more spiritual. Although Cayce died more than 60 years ago, the timeliness of the material in the readings with subjects like how to discover your mission in life, develop your intuition, explore ancient mysteries, and take responsibility for your health - is evidenced by the hundreds of books that have been written on the aspects of his work as well as the dozen or so titles focusing on Cayce's life itself. Together, these books contain information so valuable that even Edgar Cayce himself might have hesitated to predict their impact on the contemporary world. In 1945, the year of his passing, who could have known that terms such as "meditation," "Akashic records," "spiritual growth," "auras," "soul mates," and "holistic health" would become household words to millions? This vast array of subject matter can be narrowed down into the following categories: (1) Health-Related Information; (2) Philosophy and Reincarnation; (3) Dreams and Dream Interpretation; (4) ESP and Psychic Phenomena; and (5) Spiritual Growth, Meditation, and Prayer. Further details of Cayce's life and work are explored in the classic book, There Is a River (1942), by Thomas Sugrue, available in hardback, paperback, or audio book versions. Members of the ARE, the nonprofit founded by Cayce in 1931, have access to the entire set of 14,306 readings in a database residing in the member-only section of the website. The readings can also be found in their entirety in the onsite library, located at in Virginia Beach and open to the public daily. For more information on A.R.E., please visit the About A.R.E. page. If anyone wonders where a fair percentage of the knowledge within Jim's Life and The Little Universe comes from that deals with spirituality, alien wisdom, past lives and more... Edgar Cayce had a huge role in showing me the other side. Please visit thelittleuniverse.com to read more on these metaphysical novels. How come the aliens are so shy?